Constant prices are a way of measuring the real change in output. A year is chosen as the base year. For any subsequent year, the output is measured using the price level of the base year. This excludes any nominal change in output and enables a comparison of the actual goods and services produced. 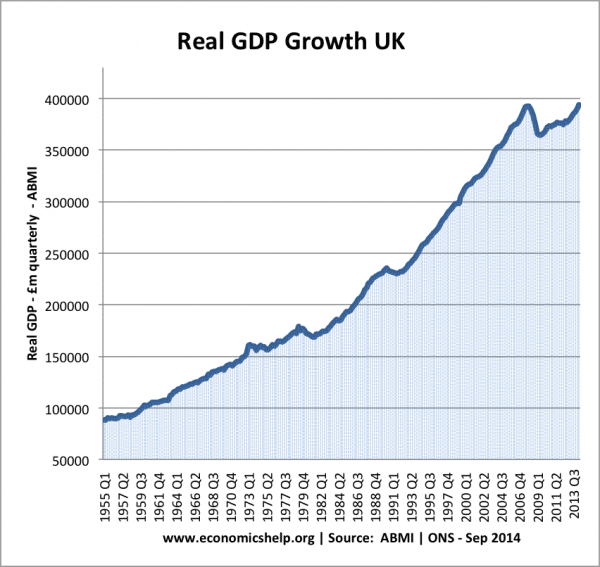 This shows the UK real GDP – GDP adjusted for inflation and measured with constant prices. A difficulty with using constant prices is that the typical basket of good changes. What people spend their money on in 1980 is less relevant to what they spend their money on now.